A common symptom of a bad Hall Sensor in your LG washer is the LE error code (read more). A disconnected or damaged motor harness and even a bad main control board can cause the LE error, too, so you may want to check the Hall Sensor itself to see if it’s working. Here are two ways to test the Hall Sensor in an LG front-loading washer. Start with an ohms test because it’s easy. But be aware that an ohms test is not conclusive– it’s merely preliminary. The Hall Sensor (and any other electrical component for that matter) can test good on ohms but still be bad because it can fail under load (when voltage is applied). That’s why ohms testing is just preliminary: if it fails the ohms test, it’s bad; replace the Hall Sensor (same for all LG models). OTOH, if it passes the ohms test, this does not prove the Hall Sensor is good– you have to go on to the voltage test to prove that. If tested off the stator using the diagram above, ohm check the resistors from pin 5 to pin 1 and pin 2. If the hall sensor is good, you should measure approximately 10 KΩ from pin 5 to pin 1 and 10 KΩ from pin 5 to pin 2. If either test shows an open (infinity) the Hall Sensor is defective and must be replaced. 2. Remove the rear washer panel. 3. Locate the Hall sensor connector on the stator behind the rotor. 4. Place the meter leads on terminals 5 to 4,white to gray. 5. Plug in the power cord,close the door,and press the power button. DO NOT PRESS START! 6. You should measure 10 to 15VDC. If 10 to 15VDC is present,the control board is OK! If not, replace the control board (look up the correct board using your model number). 7. 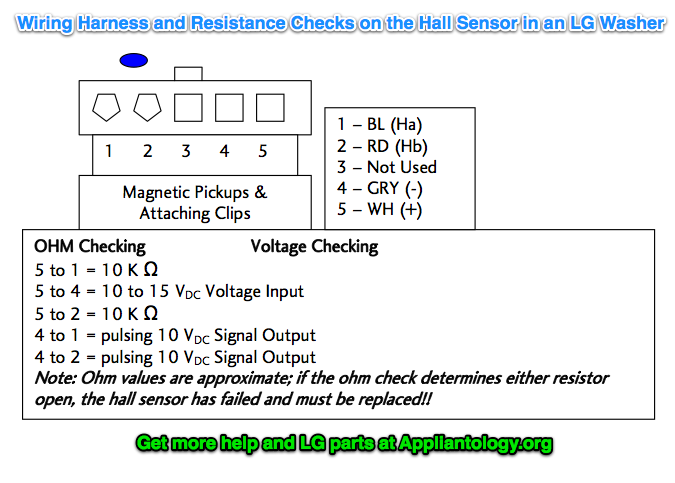 To measure output signal voltage from the Hall Sensor, carefully move test leads to terminals 4 (gray) to 1 (blue). Slowly rotate the motor rotor by hand. You should read a pulsing 10 VDC. If 10VDC is measured from 4 to 1, move the lead on the blue wire to the red wire, terminal 2. Repeat rotating motor rotor by hand. You should read a pulsing 10 VDC. 8. 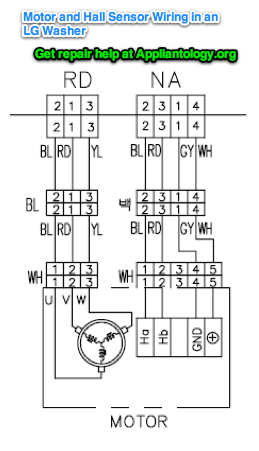 If pulsing 10VDC is measured from pin 4 to pin 1 and pin 4 to pin 2, the hall sensor is OK! If either test netted only 9 to 10 VDC without changing (no pulsing) the hall sensor is likely defective; replace the Hall Sensor (same for all LG models). This entry was posted in Washer Repair and tagged Hall Sensor, LG, washer on July 18, 2011 by Samurai Appliance Repair Man.